Los Angeles, CA, USA — Journey of Lights at Chimelong Hengqin Ocean Kingdom represents both a creative and a business milestone for Miziker Entertainment as the company, established in 1985, rounds out its first year under the leadership of CEO and Creative Director Ryan Miziker, with President and Producer Charlotte Huggins. Company founder and creative consultant Ron Miziker served as the original project director for the Main Street Electrical Parade at Disneyland and Disney World, and has continued to produce parades around the world for Disney, Lotte World and others. 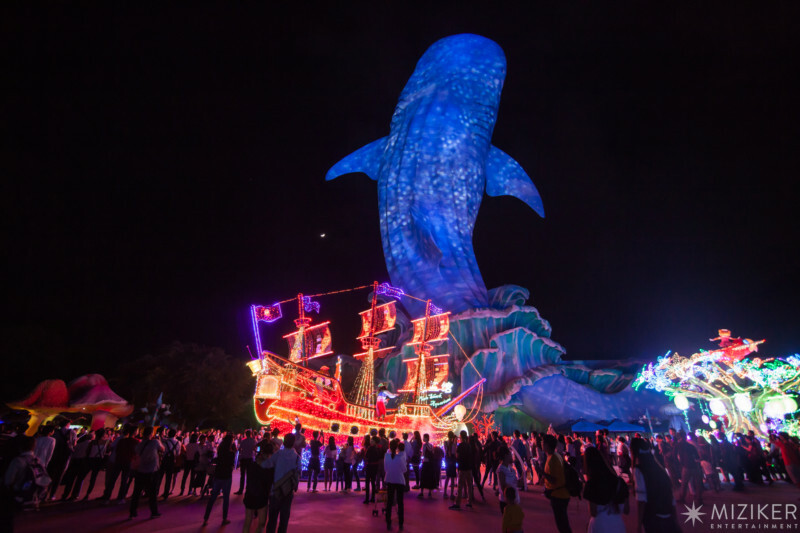 “Miziker Entertainment Group is proud to have created, developed, and provided show direction and supervision for Journey of Lights, the all-new, nighttime parade spectacular at Chimelong Hengqin Ocean Kingdom. Thanks to our client Chimelong Group, their grandest theme park has been dazzling and delighting guests with a magical, world-class parade unlike any other. Journey of Lights, which opened on October 1, 2016, achieves new pinnacles of showmanship, lighting effects, technical integration and guest engagement. We believe it will be a favorite attraction at the park for years to come,” said Ryan Miziker, CEO and Creative Director of Miziker Entertainment, a world leader in the design and production of shows and parades, media-based attractions, and memorable guest experiences. In 2016, Miziker Entertainment has delivered two major projects: Journey of Lights for Ocean Kingdom, and Chimelong Scare-adise for Chimelong Paradise in Guangzhou. The company’s next major project, a lively, character-driven daytime parade, is currently underway. As the theme park industry expands rapidly in Asia, Chimelong Group, headed by Chairman Su Zhigang, has emerged as a leader. Chimelong Ocean Kingdom, located on Hengqin Island in Zhuhai, China, is the fifth Chimelong theme park, and in 2015 was honored by the Themed Entertainment Association with a Thea Award for Outstanding Achievement. Ocean Kingdom has also garnered numerous world records, and continues to expand and innovate. Journey of Lights is a story-based show that reimagines the characters and environments of Ocean Kingdom in exciting new ways. Chimelong’s mascot characters Kiki, Kaka, Bobby, and Ocean Genie are prominently featured in their own units of the parade. Guests are drawn into a universe of light, color and music, as more than half a million individual lights become part of the story, with costumed performers and kinetic figures, all synchronized to music and special effects, making up the 40-minute show that travels around the park’s central lagoon. Then, in what is truly a world’s first, each and every one of the parade’s individually programmed lights is synchronized in a never-before-seen “Parade-Wide Event” with all the colored lights twinkling and changing to brilliant white. There are trapeze artists, dancers, acrobats, jugglers on stilts, mermaids and singing pirates onboard a dazzling pirate ship. Thanks to a custom smartphone app, the parade is also an interactive experience for guests. Significant technical and creative milestones were achieved by the Miziker team in developing Journey of Lights. “We were able to do things to create a world of magical effects, seamlessly coordinated in ways that we could only dream of before,” said Huggins, a veteran of the themed entertainment and film industries with many world-class projects to her name. Interactivity via the custom app – Guests become active players in the experience, as their smartphones synchronize with the show. Each float signals the app in turn, activating specific color changes, strobes and animations. Lighting design and programming – Full RGB control means that every single one of the parade’s million-plus lights has the complete spectrum of colors available to it – a lighting design challenge and opportunity on a massive scale, with novel storytelling possibilities. “It opened up the color choices in a mind boggling way for every moment of the entire show cycle. We made the most of it,” said Ryan Miziker. Each costume and float is lit with its own color scheme, patterns and complete audio and light story sequence. At the end of each cycle, they all come together, sparkling and glowing white in the Parade-Wide Event. DMX protocol – Lighting design on this scale required extensive programming and synchronization with the other show elements (audio, characters, animatronics, pyrotechnics). This necessitated a scaled-up lighting console to handle the lighting’s 900 universes of DMX. For comparison, the lighting for an impressive casino on the Las Vegas Strip takes up fewer than 100 universes of DMX. Show control – Each unit or float in Journey of Lights is a unique show on wheels, telling its unique story in 90 second show cycles of lights, multimedia, special effects and performance as it passes by. Each float contains its own, battery-powered, comprehensive show system, keeping all elements seamlessly synchronized. “This self-containment is what allows us to bring interactivity directly to the audience with full creative and technical control,” said Sean Chung, Miziker Project Director. Working closely with the internal team at Chimelong, the Miziker team delivered the project in about 18 months from concept to completion: a compressed timeline, especially for a project of this complexity. Chimelong set up a project team responsible for Journey of Lights to oversee and manage the project. The team was headed by Chris Ho, with Charlotte He and Bella Lai from the International Business Department, and by Paul Yuen with Raymond Lin and Michael Lee from Ocean Kingdom operations. The Miziker team included Ryan Miziker as creative director, art director John Ramirez, music director and composer Tim Hosman, lighting designer Brian Gale, costume designer Miranda Rada, technical director David Foley, choreographer Robbie Mackey and project director Sean Chung. Miziker Entertainment executives will attend the 2016 IAAPA Attractions Expo in Orlando Nov 15-18 to meet with clients and creative partners.